Brief Description of Subject: Just after Jesus's triumphant entry into Jerusalem, he took his disciples to the Garden of Olives and prophesized about the end of the world (second coming). In Matthew 25, Christ uses three parables to answer the disciples questions about this "second coming." These are the subjects for the Gospel side clerestory windows. This is the last in that series and is called the "Parable of the Sheep and Goats" --- Matthew 25:31 - 46 (KJV). It will answer the question, "What will take place at the end of the word?" (Top light) "When the Son of man shall come in glory, and all the holy angels with him, then shall he sit upon the throne of his glory: And before him shall be gathered all nations: and he shall separate them one from another, as a shepherd divideth his sheep from the goats: And he shall set the sheep on his right hand, but the goats on the left." Verses 31 - 33. 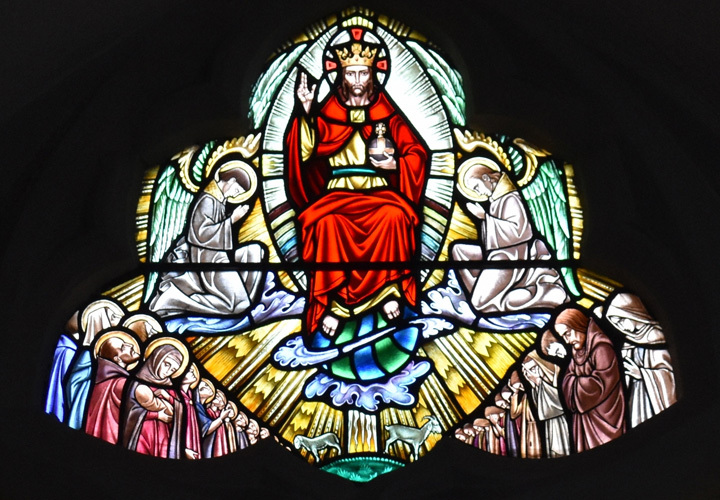 (Right light) "Then shall the King say unto them on his right hand, Come ye blessed of my Father, inherit the kingdom prepared for you from the foundation of the world." --- Verse 34. This passage is illustrated with the weighing of the souls and the righteous directed to climb the "stairway to heaven" --- also known as "Jacob's ladder" Genesis 28:12. (Left light) "Then shall ye say unto them on the left, Depart from ye, ye cursed, into everlasting fire, prepared for the devil and his angels" --- Verse 34.This passage is illustrated with the weighing of the souls and the condemned directed downward toward the fire. 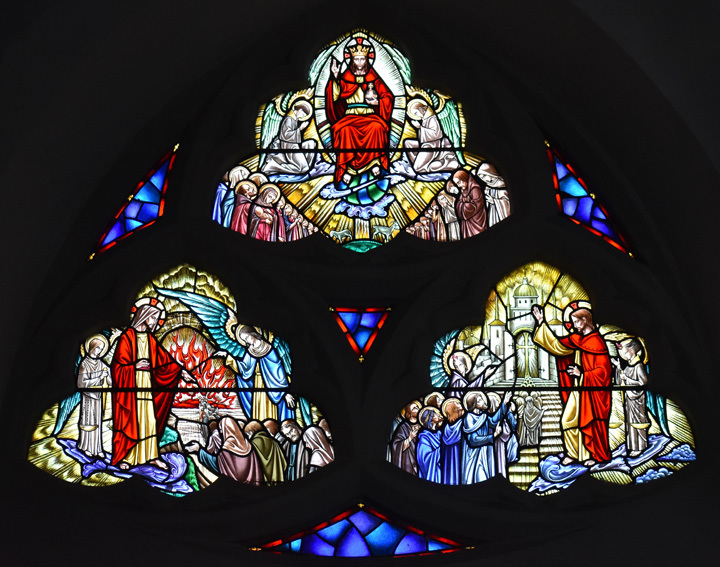 The vestry erected this window in tribute to the Pastorate of William Butler Sperry, Rector of this Church 1947 - 1966.